How to use this innovative app as a marketing tool. Instagram was born in 2010 as a photography-sharing app. Three years later it expanded to accommodate video, and today it has over one million advertisers to supplement its many features, including live stories, photo editing and filters. It currently cites 800 million active users, as well as a contingency of farms, farmers and agricultural photography, known as “Farmstagramers,” as they are affectionately referred to in the Ag Instagram world. As of August 2017, roughly 71 percent of U.S. businesses are using Instagram. That means two-thirds of U.S. businesses are putting themselves on display, whether it’s the people behind the scenes or the products and services they are promoting. Instagram is an interactive medium, allowing for users to receive and respond to likes and comments. It’s imperative for brands to take advantage of this feature and generate relationships with farmers, who can then become brand ambassadors. Put people in the pictures. Research shows that Instagram images with faces have 38 percent more engagement. This means that brands that involve their staff and include people and behind-the-scenes images will have greater interaction than those that are simply relying on product shots. Include your agronomists, retailers, scientists and, of course, farmers in photographs. People care about how their products are made, so get in the fields, on equipment, and demonstrate products to show quality, industry, size and scale. Always remember that a picture is worth a thousand words and even more views. 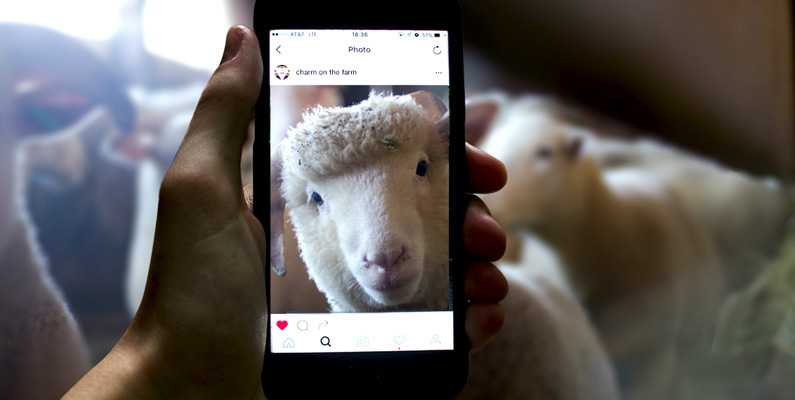 Instagram is a great opportunity for an ag brand to partner with a farm and open its doors to show daily life, such as crop maintenance, feeding and caring for livestock, upkeep and purchase of equipment, and the use of various products. This depicts farm functionality, endorses the products and services that are being promoted and how they can be utilized. Use geo-tagging and hashtagging, as a way to identify who you are and where you are physically located. Adding in #hashtags (the pound sign before a frequently-used word or phrase) also helps other users locate where you are online and connect with you. Always try to post the best quality photography and video. In the instance that those are not available, Instagram provides free editing and filters to enhance photography and make it as appealing as possible for display. Don’t forget about advertising. Instagram presents an entirely new scope of reaching audiences through advertising. If it’s the right avenue to pursue, use it. Tag and connect to other social media platforms. Each social media platform has a different function, be it text-based, video, professional or purely social engagement. Recognize your goal for posting on Instagram and then be sure to connect to the appropriate other channels to maximize your audience. As marketers and brand stewards, it’s integral to use the technology and platforms that are available and can generate not only the best return on investment, but develop the strongest relationships with farmers. Instagram continues to evolve into a solid mode of interactive, dynamic technology and is leading to positively impact businesses in ways that would otherwise not be possible.